During a mid-winter semester break, one might expect to find empty classrooms. Not for Paul Heasley, the ag science teacher at State College High School (SCHS) in Centre County, Pa. While his high school ag students had the day off recently, college architecture and design students from nearby Penn State University arrived to gain ideas for a "green" building they will design as a culminating senior project. They were fascinated by the biodiesel production (derived from the cafeteria's waste French-fry oil) and by the hydroponic food gardens. Both have brought community and national recognition to SCHS. In fact, Heasley was among three teachers in the nation to receive the second Christopher Columbus Fellowship Foundation Agri-Science Award last year. After 31 years, Heasley has a passion for challenging his students, and himself, with new things to learn and new ways of learning. "I sort of pride myself on staying on the cutting edge," he says. "I'm not the best at computer technology, but I don't have to be, when I have good tools." AgEdNet.com is one of those "good tools." This comprehensive online agriculture curriculum has been Heasley's partner in ag science education for 15 of his 16 years at SCHS. He also used AgEdNet.com during his previous tenure at another school district. Heasley's high school ag science students are involved in some high-end projects. They also have the opportunity to take dual-credit courses at Penn State. Within this progressive learning environment, Heasley uses AgEdNet.com as both an introduction and a supplement. This enables him to offer a higher level of instruction for each curriculum area. "I use the AgEdNet.com Power Point presentations, and some of the reading, as support instruction and introductory instruction," explains Heasley. He appreciates the breadth of available lessons and activities that are classroom-ready and customizable. "I use the literacy portion to build student skills, and I'm working with AgEdNet.com's information to expand our ag program offerings into the ‘virtual school' here," says Heasley. Student access to the ag sciences is a high priority for Heasley. He has grown the SCHS ag science program from 32 students in 1996 to 150 students in 2012, enrolled in four career paths -- animal science, plant science, ag mechanics and natural resources. "I'm using AgEdNet.com as a basis for more students to have access to our program and its four career paths," Heasley explains. "I want to do this both vertically and horizontally by developing some ‘virtual' offerings in those four key areas. AgEdNet.com is a key to helping me do this because it enables us to offer some introductory and assessment pieces without the students having to physically be here." Specifically, Heasley matches the AgEdNet.com lessons to the SCHS ag science programs and chooses the assessments he wants the students to do. This facilitates some introductory ag science for ninth and tenth graders -- even middle school students. "This way, students can get the introduction without interrupting any other schedules they may have here," he explains. "I see AgEdNet.com as a tool that helps our program be much more flexible." Animal science is a good example. It can be difficult to provide quality, hands-on learning in the high school classroom or lab setting. "I've identified the lessons I want to use from AgEdNet.com. That's the foundation, and we customize it," Heasley explains as he demonstrates a sample lesson that goes from Power Point right into a video in a dairy cow barn, and then includes some extra reading. "To check their understanding, the lesson quizzes the students," he points out. "It's all part of the lesson, and we're just building it to fit our instruction sequence." The students also can get instant feedback on their own progress and can go back and improve. AgEdNet.com also helps Heasley integrate his ag science program with the other sciences, and it incorporates a service-learning piece. "When the elementary students are learning about plant science, our hydroponic units offer something that's a little more hands-on for them," Heasley relates. The high school students take the "gardens" to the elementary schools and then the elementary students donate them to a housing transition organization as a supplemental food source. With four ag science career paths to cover and an emphasis on hands-on extensions for discovery in the ag science program, Heasley says it's nice to have an online resource like AgEdNet.com to cover all the bases and improve student access to ag sciences. Photo credit: Paul Heasley is the lone ag science teacher at State College High School in central Pennsylvania. The 2011 Christopher Columbus Fellowship Foundation Award winner has initiated agricultural discovery projects that have drawn community and national attention. 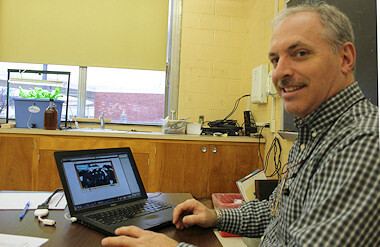 On the computer screen, he pulls up a video tour of a dairy cow barn, to accompany his AgEdNet.com animal science lesson. In the background is one of the hydroponic food gardens the high school students take to the elementary schools during their plant science units, and -- sitting on the counter beside it -- is the 1000th gallon of biodiesel produced by the students. They run their own production process that turns the cafeteria's waste French-fry oil into usable energy.